This year’s parade will be held on Saturday, September 22, 2018, beginning at 10:00am. Although the Agricultural Society participates in and supports the Guilford Fair Parade, it is managed by the Guilford Rotary Club. For information or an application for the parade please go to the Parade website at guilfordfairparade.com. “The Guilford Rotary Club would like to extend you an invitation to participate in the 2018 Guilford Fair Parade, as either a member of a marching unit or as a spectator. The parade will step off at 10:00 a.m. on SATURDAY, SEPTEMBER 22nd! This year, the theme is “Life at the Shore,” with a focus on the activities that make our shoreline community a special place to live and work. 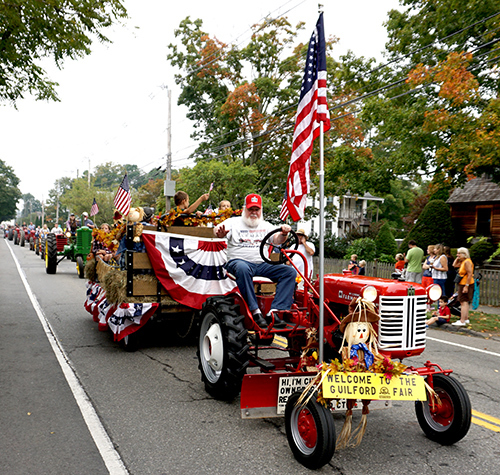 The Guilford Fair and Guilford Fair Parade have a 159-year history of honoring agriculture in Guilford. This year, to emphasize the importance of aquaculture in Guilford, the Grand Marshals of the Guilford Fair Parade will be local people involved in the cultivation of aquatic animals and plants in natural or controlled marine or freshwater environments. TO APPLY TO PARTICIPATE IN THE PARADE, please complete and submit the Application, including the release form, ASAP, but no later than September 1, 2018. Click on “Application” above to complete the registration information. If your unit includes a motorized vehicle, a Certificate of Insurance must also be provided by September 1, 2018. For details, please see #6 in FAQ. If you are a MUSICAL UNIT, please refer to #5 in FAQ for details. If you are entering a FLOAT, please refer to the FLOAT INFORMATION PAGE. We request marchers be in the Line of March by 9:00 a.m. Your spot can be located by pairing the number your group is e-mailed the week of the parade with the number that can be found on Whitfield Street (or a nearby side street) the morning of the parade. Marshals in red vests will be available beginning at 8:00 a.m. to help you find your spot. For any questions, please refer to our FAQ. Thanks! We look forward to seeing you at the parade! Again, please visit the Guilford Fair Parade website (guilfordfairparade.com) for application and complete information about the Parade.